A year ago, as a result of a major fraud investigation, the Israeli diamond industry teetered on the brink of collapse and threatened to plunge the Israeli economy into a disastrous tail-spin. In a clear example of the dangerous over-reliance of the Israeli economy on diamonds and the power of the Israeli diamond industry, an investigation by police and tax authorities into an illegal bank operating in the Israeli Diamond Exchange, involving fraudulent trading worth billions of shekels, was shut down, covered up and silenced to protect the diamond industry - one of the " cornerstones of the Israeli economy". The orchestration of the media silence which facilitated this cover-up of a criminal scandal has only recently been divulged by Yair Sahar, president of the Israeli Diamond Exchange, in a remarkably open interview with Michelle Moshelian of the Israeli Diamond Institute. The story first broke on 8th January 2012 when Israeli media reported (1, 2,) that police and tax authority investigators arrested 16 people and raided their homes and offices in the Israeli Diamond Exchange . The reports indicated that police had secretly monitored the activities of the group for over a year and discovered the operation of an illegal bank that offered loans, money transfers and currency exchanges which were not reported to tax authorities in Israel or abroad. Apart from reports on an Azerbaijani news website "World's largest illegal bank unmasked" and the website of an Indian jewellery magazine which refers to a Globes report (which may have been deleted), very few, if any, other English-language media reported this major crime story that ensnared the Israeli diamond industry and threatened the Israeli economy. The silence was broken on February 9th 2012 when a report in Haaretz detailed the devastating impact the police investigation was having on the Israeli diamond industry. According to the report, the industry suffered a 70% drop in business in January and the entire sector had been thrown into turmoil resulting in a number of diamond firms going bankrupt leaving $30 million in unpaid debts. Moti Ganz, the former president of the Israeli Diamond Manufacturers Association, is quoted as saying: "the investigation has ruined the industry. The import of raw material has collapsed, and if there is no raw material now then in another three or four months there will also not be any exports of polished diamonds." The media silence resumed again until February 23rd 2012 when Rappaport reported that Israeli authorities had agreed to suspend the investigation for one month. A member of the Israeli Diamond Exchange, who requested anonymity, stated that a professional team would be established to "negotiate a suitable solution to the affair." But at that stage the damage was done and confidence in the Israeli diamond industry was severely eroded. 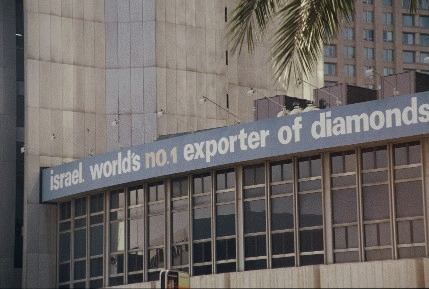 As a result, Israel's polished diamond exports dropped 81 percent year on year in February 2012. Instead of following procedures normally adhered to in a criminal investigation where evidence is collated and presented before a judge and jury and, if found guilty, the perpetrators of a crime are punished in open court, the Israeli authorities agreed to suspend the investigation and negotiate a deal with representatives from the Israeli Diamond Exchange. In the interview for the Israeli Diamond Institute Yair Sahar describes the fraud investigation as " an earthquake that threatened to topple everything that has been built here over decades". Recognising the seriousness of the situation and the vulnerability of the Israeli diamond industry, leaders of the sector met in an emergency meeting and immediately set up a steering committee to control and manage the crisis. In order to avoid adverse publicity "of events that we could not control" Sahar said the steering committee decided "not to address the press" and, without giving details of how the Israeli media was gagged, they "managed to achieve "media silence" which meant no media outlet publicising the police actions, and very little publication of the events'. In an unprecedented move, the steering committee sent a delegation to meet directly with the commanders of the investigation to explain "the massive effect the investigation was having on the entire industry." The delegation outlined "the centrality of the diamond industry to the Israeli economy". Quoting a turnover of $28 billion, exports of $11 billion, employing 20,000 people and responsible for supporting 100,000 men, women and children as well as employing 35,000 people abroad and other impressive statistics the delegation outlined the status of the diamond industry in the State of Israel and in the world of diamonds. Seemingly oblivious to the discrimination of the diamond industry against non-Jewish citizens of the State of Israel, who, according to statistics from the Israeli Central Statistics Office, are grossly underrepresented in employment by the diamond industry, Sahar told the police commanders that their industry "has never caused harm to even the smallest person in the State of Israel". A human rights activists from Ireland with a particular interest in the Israeli/Palestinian conflict and the global trade in diamonds which are a major source of funding for the Israeli military regime. Are Sotheby's Steinmetz diamonds blood diamonds?